I am Already Number 1 on Google… Why Do I Need SEO? Hi everyone. I am Andrew, co-founder of Service Autopilot Academy, the official coaching group for service professionals, lawn care, HVAC, cleaning services and everything in between. We help entrepreneurs take their businesses over a million dollars a year and beyond. I also have a marketing agency that focuses on service businesses as well. One of the things that we came across today when I was speaking to one of our new client who we built one of our high converting websites for to help them generate leads online, is that after we built the website, we have start thinking about, well how are going to get people to the website. We have to have to get them to the website via offline methods, everything from our truck branding to lawn signs to door hangers to direct mail; all of those offline tactics and of course online. PPC, SEO, Facebook ads … all of that good stuff. When the conversation turned to marketing efforts after we built the website, the gentleman commented to me, “I don’t need to do anything marketing wise with you guys. I’ve already got a company that has me ranking in the number one position.” I say, “I wasn’t aware of that. We just built a website for you. They certainly haven’t optimized it. What exactly did you buy? Do you know what you purchased from this company?” The gentleman said, “Yeah, I got a call out of the blue from some guy who guaranteed me the number one ranking within Google.” Immediately I knew exactly what he purchased because this is a common tactic. A lot of small business owners get calls from time to time from individuals saying that they work with Google or that they can guarantee the number one ranking within Google, which is not true. What the gentleman purchased … he was actually purchasing ads, Google AdWords ads. Google AdWords ads show up at the top and at the side of any Google search results page. This is a search I did for lawn care in Tulsa. The gentleman thinks that he has the number one ranking in Google. The thing that he’s not aware of, and this is a really critical consideration. It’s also one of the reasons why we don’t do one shot marketing. We don’t offer one shot, a la carte marketing. We only do marketing programs, complete programs for our clients. 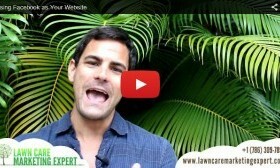 What he’s missing out on and what he wasn’t aware of is that when all you’re doing is Google ads, if you’re showing up in these areas and these areas over here, you can only potentially get 15% or less of the visits to this keyword, to lawn care Tulsa. All of the other clicks on this page, 85% of them, are going to these area here. They are going to the first page of the search results and they are going to the local listing area here as well. So if all you’re doing is running some ads, the maximum number of click you could possibly get from that search is 15% of the total searches on lawn care Tulsa, which is not much. 15% of the people who visit this page and do this search, they’re clicking on this ad, this ad, this ad, this ad, this ad, this ad, this ad, this ad. They’re clicking on one of those ads, 15% of those people. So by only taking up a one step marketing approach, by only implementing one tactic, you’re missing out on a whole lot of opportunity. That is something that a lot of business owners need to be aware of, especially as service professionals, lawn care companies, HVAC. These companies typically don’t go far enough and it’s mainly because the business owners don’t know exactly what they need to be doing. Let’s break this page down a little bit so I can show you some of the key areas. The first thing we need to understand as business owners is that our consumers, the people that would hire us to do business with us, they’re searching for service providers like us in several different ways. Not everybody searches the same way. Some will go directly to Thumbtack. Maybe some will go to Home Advisor, some to Angie’s List. A few might go there. Others will go to Yelp or they might go to Yellow Pages, or any of these other number of services. Others might click on a banner ad that they saw within Facebook or on a third party website that you might be advertising. The largest majority, they’re going to be going directly to Google or Yahoo and searching, typing in their city name and the service they are searching for. That’s typically what people … that’s predominately how people search. If we break down this page, look at all of the different places that we need to be showing up because it might not be completely obvious to you. If we’re running an ad, which we recommend that you do, you have an opportunity to get a little bit of traffic. But consumers are getting wiser and wiser and they know that these areas are ads. The number of potential leads that you can generate just from these ad areas is going down, and that’s going to continue to decline over time as consumers get smarter. As consumers get smarter, different marketing tactics, different marketing strategies, need to shift overtime. This second area that we need to be aware of is what we call the Google local area. This area right here is completely separate from how you would show up in this area down here in the search results, and over here in the ads. These require that you set up a special business page and there’s probably about 100 other factors that play into how well you show up within this area. If you don’t have an address within Tulsa, there’s no way that this business could show up in this area. If you don’t have high quality reviews, if you don’t have many reviews, then it is even less likely that you will ever show up in this area. So there are a lot of different factors that you need to consider when you’re trying to have an all encompassing marketing strategy. The other area that we need to be aware of is this area down here. This is what we call organic search results. This is an area that we can rank our clients in very well via using search engine optimization and other tactics like that. The other thing we need to look down here is what else do we see. We see Thumbtack. We see Better Business Bureau. We see some of these other directory sites. There’s Angie’s List. We need to be aware of the different places that we need to list our businesses as well. Just looking at this page, there’s multiple marketing tactics that need to be involved so we an have the maximum exposure to your market. We need to be appearing within ads, Google ads. We need to have a percentage of our marketing budget going to that. We need to have a well thought out strategy to get us to rank really well within this local area. Very, very important. That means we need a review strategy, which is what we teach in Service Autopilot Academy. We have the best review strategy out there on the market, hands down. It took the first lawn care company ever to be 100 5-star Google reviews. It’s fantastic. We also need a strong searching job optimization strategy. We need a properly optimized website so that we are ranking up here very well for that particular service; lawn care Tulsa, in this particular case. What else do we need to be aware of? We need to also have our business listed and have reviews on local listing sites, such as Yelp, such as City Search, such as Manta. All of those different sites, they also have our opportunity to rank within here if you get reviews. If you maintain them, if you have a strategy for doing that, there’s a very good chance that those pages could show up here within the search results as well. When all that we’re doing is implementing one marketing tactic, Google AdWords, we’re missing out on all this different opportunity down here on the rest of the page. When we implement a marketing program for our clients, we never just do one thing. We don’t offer any a la carte services. We offer a full marketing program. That generally includes 5 different marketing tactics. It includes a local listings, which gets you ranking well within this area. It includes a strategy to get reviews, which is very, very critical for you to rank well within this are and get clicks. It also includes an [inaudible 00:09:23] program that gets your website showing up really strong in this area. It also includes, like I mentioned, a local listing program which also lists you in the most important local sites: Yelp, Manta, City Search … all of those different sites that have the opportunity to rank within this area as well. I want you guys to think bigger. Put yourself in the consumer’s shoes and really think about how your market if finding service providers like you. That’s the first step. Once we understand that, we need to really think through all of the potential opportunities where we can show up and make our business visible to them. The other thing we need to consider is that this is just one search term. This is just one key phrase, lawn care Tulsa. But for your business, whether you’re HVAC, or cleaning services, you’re probably going to have over 5000 different key phrases that could potentially bring you clients. So if you are just doing one thing, you’re missing out on a whole lot of opportunity. You need to think bigger. You need to think bigger. That’s just kind of a breakdown of the page. I would love to hear some feedback from you guys. Please comment and reply to the video. Ask me any questions. I’d be happy to answer them for you. If you would like more information about our coaching group, you can visit Service Autopilot Academy for all the information on how we help businesses explode their profits, get more fun out of life and their business. Make it happen.